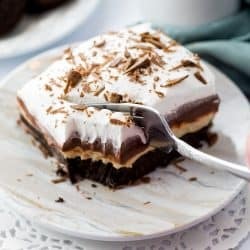 This no bake Peanut Butter Pie has a sweet and buttery Oreo crust topped with layers of chocolate pudding and whipped peanut butter filling. It’s then topped with bits of shaved chocolate and is serve chilled. 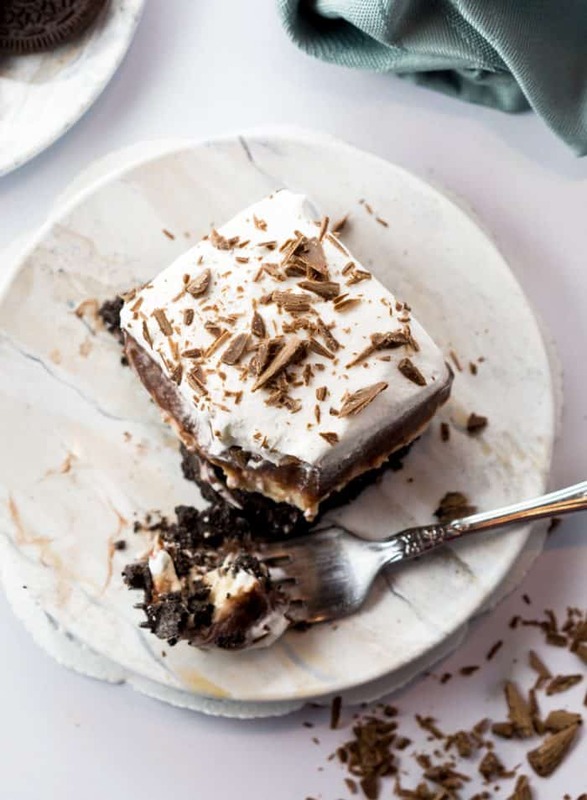 This is a variation of another dessert that I love making, Oreo Delight, (essentially the same thing without the peanut butter), and I’m realizing now that it’s not too far off from my Raspberry cream pie cupcakes. Apparently I really enjoy Oreo crusts with different flavors of whipped deliciousness on top. I’m only human after all. If there’s one problem that I have when I make this peanut butter pie, it’s the fact that using the food processor to make the crust scares the living crap out of my toddler. If you’re in the same boat, or don’t have a food processor, take a rolling pin and pulverize those suckers, it’s kind of fun. Will you just look at this filling?! I toyed with the idea of making a cherry layer instead of a peanut butter one. Valentine’s Day is in just a couple of days. But, peanut butter won. Cherry will have to wait until next time. What other layer ideas would be good for this?! If you haven’t already joined my free recipe email list, please do! You’ll get a weekly email with my brand new recipes. And follow me on Facebook, Instagram, and Pinterest so we can talk food all day long! 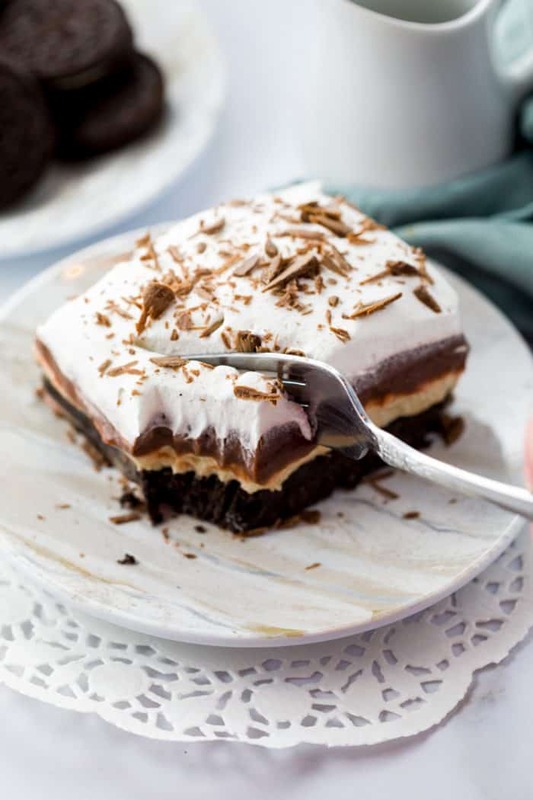 This no-bake Peanut Butter Pie has a sweet and buttery Oreo crust topped with layers of chocolate pudding and whipped peanut butter filling. It's then topped with bits of shaved chocolate and is serve chilled. 1 package chocolate instant pudding 5.9 oz. In a large bowl, mix together the melted butter and the Oreo crumbs. Using an electric mixture, combine one of the (8 oz.) Cool Whip tubs, the cream cheese, peanut butter, and the powdered sugar. Beat on medium-high until smooth. 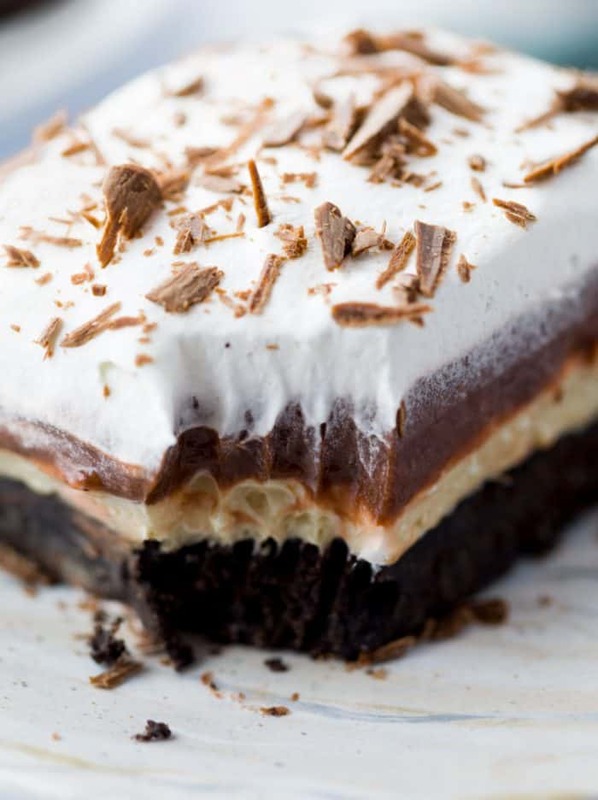 Spread the peanut butter layer over the Oreo crust. Make the instant pudding according to package instructions. Once set, add this on top of the peanut butter layer. Use the remaining tub of Cool Whip to create the final top layer. Best if chilled for a couple of hours prior to serving. My kids would love this! I think they could help me make it too! Love it!